Have you added or changed some stores in your Stockist account, but aren't seeing them when you check the locator on your website? When you first create your Stockist account, your locator is set to automatically estimate your visitor's location and only show stores that are nearby. If the stores you've added are far from your current location, they may not show up. You can increase the "search radius", which controls the maximum distance the locator will look for stores. Or, you can set your locator to show all your stores (not just nearby ones) as soon as it loads. Both of these options are on the Search settings page of the dashboard. Did you recently import a list of stores with our CSV upload tool? If so, it may not be published yet. When your upload completes, the new store list is unpublished. This gives you the opportunity to make any adjustments or corrections to the new stores before they're live on your store locator. To publish a pending import: click the import name, then click the "Publish import" button. 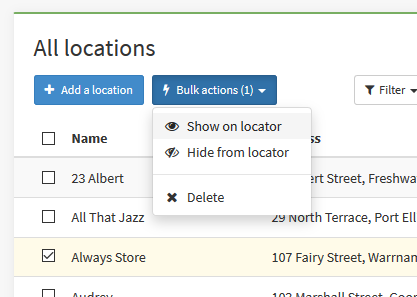 It's possible to set a store as "hidden", which leaves the store in your account but prevents it from appearing on the locator. This can be useful if a store is seasonal or temporarily out of stock, and can also happen if your account has reached the store limit of your plan. To check for this, open the location listing page on the dashboard and search for the store (by name or part of the address, e.g. the city). If the status column for the store is listed as "Hidden", the store won't appear on your locator. To correct this, select the checkbox next to the store, then from the "Bulk actions" button that appears, select "Show on locator". If you're searching for a large area like a country or state (rather than a city, town, or specific address), the results may not show the complete list of stores in that region. For further explanation and some potential options, please see: I'm not seeing results when searching by country or state. If you visited your store locator right before you made changes, your browser may have saved the store list at that time and re-used it in a subsequent visit. Browsers do this so that the page loads more quickly, but it can delay your changes from showing up on your device for an hour or two. To avoid this, try checking your locator in a private/incognito browser window. This should ensure your browser uses the most recent version of the store list. If this doesn't help (or you were already using an incognito window), you may also want to try holding the shift key while reloading the page, or clearing your browser cache via your browser's settings to erase any saved list. If none of the possibilities above fixed your issue, please get in touch with us and we're happy to help investigate.